Lopen Namgay Phuntsho from Punakha was a teacher since 1973. It was an emotional moment when I saw about his retirement on the Facebook. He is finally done with his job. In last 40 years he made differences in lives of thousands. Those thousands include me. 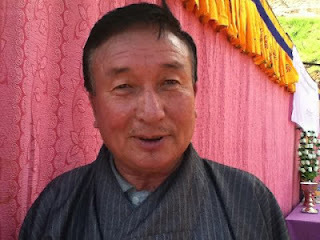 This great teacher and I crossed our paths in Drukgyel and I spent four best years of my life under his care. During my days in Drukgyel I feared my share of fear and loved this man as much. It didn't take long before I understood his true content. He was the personification of truth and Justice and maintained these two greatest principles throughout, that no soul ever dared challenge this stainless man. He made us believe in truthfulness, and we trusted him for justice. When I took my first step in Drukgyel the first advice I was given by my seniors was to tell the truth if I was caught doing mischief. His long experience has given him the super ability to detect lies, and thus becoming the first known biological Lie-Detector. He would throw a few question and if the culprit is lying he would turn very red (perhaps this is where he got his nick name- Asha Maap, which mean uncle Red) and remove his HMT watch and the show goes on until the truth comes out. The best part of the man is that he honours truth. He would stop when the truth comes out, and it was up to us to decide when to tell it. That taught us life's best lesson. I was caught drunk with two of my friends and even before he asked I told him I drank beer. He said, "Even beer can make you drunk, but it's better than whiskey." He took us home and offered tea and he never mentioned about the beer. That's it. I never dared another bottle of beer until the last few days in Drukgyel. About justice, this man was the leveler. In his hostel it's ok to be a villager's son to enjoy equal privileges. My three years of torture in Gaupay and three years even before that in Dawakha had made me believe that we were lesser human and that we only deserved lesser than those from richer families. But in Drukgyel Lopen Namgay Phuntsho called us all by our names and he took us for who we are and not for who our parents were. Every punishment is justifiable against our mischief and nobody cries foul, we just cry. He did not have a list of favorites, nor did he have a blacklist. Life in Drukgyel was fun and scary but not insecure, thanks to this man. I faintly remember an incident where he was firing a boy and the boy was begging for mercy, and from his house came his old mother with a stick and our deadly warden ran like a little boy. That boy was rescued. I loved that incident, not because the boy was spared but because it showed how he still remained his mama's boy. After nine year, that was last year, I met him in Lobesa. At first I nearly ran away then I remembered I was a married man with a daughter now and that I have also become a teacher, but that one instant when I saw him it transported be back to Drukgyel. To my grandest surprise he shook my hand and said, "Passa Tsheri, you are teacher in Bajothang no? Kinley Dorji has finally become an army officer..." He not only remembered my name and found my address, he went on telling about all my friends whom even I didn't know where they were. He was a human encyclopedia. I was spellbound. So, next time you meet him be prepared for surprises! I thank him for being there in my life and playing very important role in my transition from a boy to a man. He also has a great role in the type of teacher I have become though I can never be half as good as him. Only thing about him that I didn't consider in shaping my life was his English, that was better left for himself. I wish him a very very happy days ahead. I will remember him as one of the most respectable lopen of my time. Wish him gud health. Warm remembrances. Very inspiring post. I love the way your Lopon ran off his mom. That is the truth that we want from him, he is still his mom's son. We are in need of a lopon like him. I too had some of my teacher who is like him, and we never like them when in school but we realize how good they are after we become a man (ever students do the same). Keep posting and keep us reading. I wish Lop Namgay a fruitful retired life. Of course I have a long way to go. Lop Namgay gave to Bhutanese Education System his best. He supported me to stabilise as a teacher during my initial days at DHSS. In 2004 after I had left the teaching profession, I was called to receive a rare citation signed by the then Dzongdag of Paro, the then DEO and the then Principal of DHSS. Lop Namgay was there too to receive the citation. For both of us it was a great honour. I don't know if I deserved it but Lop Namgay definitely did earn it. His hard working nature and sense of truthfulness is quite admirable-somthing that aspiring teachers must adopt. Good tribute to a great man, Passu. He too must be proud that he had a student like you. I seldom write any comment on blog, though i follow some. But here would like to share an incident. I was travelling from Gelephu to Thimphu together with a newly acquainted gentleman. While gossiping on various topics both of us happened to be your blog follower. We talked about how interesting your articles are, how talented and gifted writer you are on our judgement if at all we are qualified to judge you, and blah blah.. We even discussed about your comment on Wangdue Dzong mishap when the ruin of the Dzong was on our sight from the highway. We laughed on that famous hand shake at South America shaking the Great wall of Wangdue Dzong. The Tibetans across the globe must have smiled too. Our discussion on Passu's diary must have started from somewhere Kamichu and continued till we reached opposite to BHSS from where one of us commented "that is where our Passu lives.... But just before that both of us unanimously agreed that something is not right about the way the Bajo town has shaped up. At least looking from the highway on the other side of the river it looks so " i dunno what to say..." Since you were the main topic of our discussion we fantasize a situation that one fine day Passu would pay a beautiful tribute to the architect/planer of Bajo, a modern 21st century township of Bhutan. Both of us laughed on our fantasy. Thanks you friends, this was the lest I could do to honour the great teacher with who I spent 4 important years of my life, and the man who changed the lives of thousands.